Here we are going to cover the topic of sealing which is quite basic but it’s new to a lot of people who have purchased or are thinking of purchasing terracotta for the first time. Don’t let people put you off by saying ” oohh terracotta needs waxing every six months and it’s a right palaver…” Wrong!! with today’s sealers there is no need for waxing, but if you wanted to, it’s quite easy to purchase a liquid wax and apply by brush or cloth. Then if you wish, you can coat it with a wax protector this way you will be using the floor for years and have a floor to the envy of others. Back to the sealers, terracotta is a natural product and very porous and as with every natural flooring whether marble, limestone, slate, travertine even granite and limestone they all need sealing. Terracotta which is a natural product made from three natural elements earth, fire and air is a clay tile kiln dried at a high temperature to the same methods as the Romans and before, Roman terracotta floor tiles are still being dug up today 2000 years later in situ and intact proving their durability even without sealers! When you seal your terracotta is a personal choice, it can either be done as you lay your tiles or once laying is completed. All tiles must be clean and dry before sealing otherwise you may seal in dirt or moisture which will impair the final appearance. The process of sealing should be kept meticulously clean and all materials including brushes, paint pads and cloths etc. should be new and unused. The drying times recommended in the following pages may be altered by the actual site conditions (heat, humidity, ventilation etc.). Please refer to the manufacturers’ guidelines on drying times for each product. Living Terracotta recommends that traffic across a newly sealed floor is kept to a minimum for the first week as sealants can take a few days to fully oxidise and may not be fully effective during this time. 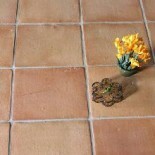 NB Some of our Stoneware terracotta tiles and pre-sealed require only final coat sealing. The first coats of sealant or primer are used as a protection against the grout, an unsealed terracotta is very porous and any grout on an unsealed surface will absorb into the terracotta. We recommend that a number of sample tiles are tested for porosity, which will give an indication of the amount of sealer the tiles will require. The tiles will readily absorb the first coat of sealant and as a rough guide you should expect to use up to 70% of the sealant on the first coat. Once grouted final coats can be applied covering grout lines as well for complete protection. This entry was posted on June 18, 2013 by Living Terracotta in Terracotta sealing tips.